Church is the religious place of worship for Christians. 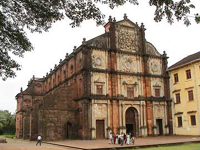 Go through this article and learn about the history and types of Christian churches. The Church is an edifice where followers of Christianity pray and take the blessings of Jesus Christ and the Virgin Mary. It was during the 11th to 14th centuries that cathedrals and small churches were built within Western Europe. In the earlier days, the church was used as the place for meetings, feasts and to store grain. It was built in a shape of cross, with a dome or a tower. Sometimes, this establishment had a large curved space in the interior side to draw the attention of Paradise. Star shaped churches were built to resemble the light that the church is passing to the Universe. In modern times, a church is built using architectural molds and patterns. In India, it was the Portuguese who initiated the construction of these bodies. Even though there are different kinds of churches and its believers, all Christians follow the holy book: The Bible. On the commemorative days and Sundays, these groups of people get together in a church and pray for the well-being and happiness of each other. This apparently leads to prosperity and pleasure on Earth and in heaven. At the time death, candles are lit and prayers are chanted in the church for peace and bliss of reincarnation of the soul. There are different types of churches which include Roman Catholic Church, Anglican Church, Orthodox Church and Protestants Church. They are known as denominations and each of these churches varies in terms of values and philosophies related to Christianity. This is one of the most popular types of church in the world which is looked after by the Pope. The main motive behind these churches is to spread the teachings of Jesus Christ which comprise of rites, rituals and lessons of charity. The Roman Catholics believe that the Catholic Church is the original one founded by Christ and, his disciples/bishops are successors of Christ himself. A large number of people across the globe pray in the Roman Catholic Church. Besides this, there are catholic schools, universities and hospitals. In this kind of church, the teachings revolve around the 16th century German activist, Martin Luther. These kinds of Christians believe in justification and that human beings are protected from sins by the mercy of God and trust on Him. According to Protestant Church, there are three persons who have made this world i.e. the Father, the Son and the Divine Soul. The Orthodox Church is the second largest in the world with an aim to bring the people closer to God from infancy. The method is known as Theosis where every believer of this church tries to become like Jesus Christ. They believe in the Final Judgment of a person after death and on this day, the soul and the body reunite in heaven.